The Preservation Amputation Care and Treatment (PACT) program in Nashville decreased amputation rates by 40% in patients with diabetes. Here’s how they did it. Clinicians who treat the lower extremity know that of all the pathology that can affect it, few medical problems present more challenge, are more complex, cause more damage and result in wounds more difficult to heal than those caused by the co-morbidities of diabetes. Chronically elevated blood glucose levels are responsible for the processes that impair the neurological, vascular, and immune systems, which can result in a variety of medical problems to the lower extremity of the patient with diabetes. When it comes to the foot and leg, we know with almost 100% certainty how they will be affected by diabetes. Diabetic neuropathy and its three subcategories — autonomic neuropathy, sensory neuropathy and motor neuropathy — can leave the lower extremity vulnerable to silent or painless trauma. That is the triggering event that can ultimately lead to lower extremity amputation. A compromised circulatory system fails to bring enough fresh oxygenated blood, nutrients, and antibiotics to a traumatic wound, and the immune system cannot resolve an infection by fighting bacteria and cleansing the wound site on a cellular level. As the complexity and severity of problems involving the foot and leg increase, so do the costs of treating them.5 The total annual economic cost of diabetes in 2007 was estimated to be $174 billion. Medical expenditures totaled $116 billion: $27 billion for diabetes care, $58 billion for chronic diabetes-related complications, and $31 billion for excess general medical costs. Inpatient hospital care costs totaled $58.3 billion, not including $9.9 billion spent on physicians’ office visits, directly attributed to diabetes. Diabetes-related hospitalizations totaled 24.3 million days in 2007, an increase of 7.4 million from the 16.9 million days in 2002. The average cost for a hospital inpatient day due to diabetes is $1,853 and $2,281 due to diabetes-related chronic complications, including neurological, peripheral vascular, cardiovascular, renal, metabolic, and ophthalmic complications. The three core parameters to be tested in a valid foot ulcer and leg amputation prevention exam include: vascular testing through the evaluation of pedal pulses; neurological testing to assess loss of protective sensation (LOPS), determined by the monofilament test; and deformity identification with regard to the bones, soft tissues and toenails. Figure 1. Palpating the dorsalis pedis pulse. Figure 2. Palpating the posterior tibial pulse. The two pulses to be evaluated on each foot are the dorsalis pedis (DP) and the posterior tibial (PT) pulses. Palpating a foot pulse is a skill that takes time for a practitioner to develop. The key issue is the amount of finger pressure that the examiner applies against the artery when palpating. Too much pressure may occlude the artery, causing the examiner to believe that the pulse is weak or missing. Not enough pressure may cause an examiner to miss a pulse. The examiner must be sure he is not reporting his own pulse instead of the patient’s pulse. Traditionally, pulses are graded from 0 to 3. There are differences in how practitioners perceive and grade foot pulses. I use a system of narrative description– Absent, Barely Palpable, Palpable, and Bounding — to report pulses. This narrative style helps me better understand the patient’s vascular condition and eliminates any ambiguity of grading and reporting the pulses in the number system. When not all pulses are readily palpable, I locate one palpable pulse of the four to be checked. I keep my hand on that pulse while I palpate the other pulse locations with the other hand. The already identified pulse gives me the baseline rate and rhythm of the pulse, so that the other three pulses can be more easily identified. Figure 3. Performing the monofilament test. The monofilament test for evaluating loss of protective sensation is the gold standard for identifying patients at risk for lower extremity amputation. Almost 30% of people with diabetes aged 40 years or older have impaired sensation in the feet (i.e., at least one area that lacks feeling).5 Research indicates that the monofilament testing device is an inexpensive, reliable and easy to use clinical indicator for identifying patients who are at risk for developing foot ulcers and subsequent amputations.10,29,34,35 Those patients unable to sense the 5.07 wire on any part of their foot should be prescribed preventive care. This should include ongoing professional foot care when necessary, patient education, and appropriate insoles and/or footwear. There has always been controversy about how to perform this test properly: how to touch the foot, where to touch and where not to touch the foot, and what constitutes a valid monofilament exam. Since this exam provides the most critical information in the decision-making process for care, it must be performed, documented, and interpreted correctly in order for a practitioner to identify a patient’s risk factors and prescribe the most appropriate preventive care plan. Before the practitioner administers the monofilament test, the patient must be educated about the test and acknowledge their role in responding to the test. I show the monofilament to the patient, and then touch their hand or arm with it so they will know what it feels like. Then I instruct the patient to say the word ”yes” if they feel the monofilament when it is touched to their skin. At this point, the patient is laid back in the treatment chair and asked to close their eyes. There are three different variations or methods to performing this test. 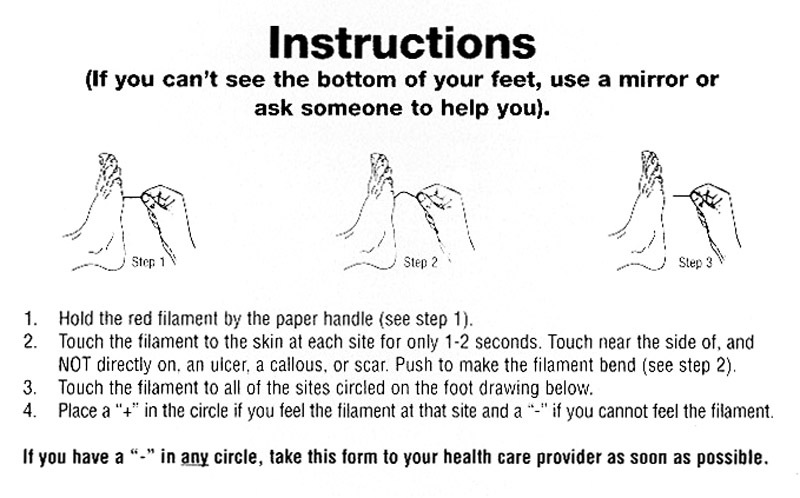 The first is the “Yes-No Method.” In this method, patients are instructed to say “yes” if they feel the monofilament when it is touched to their foot. 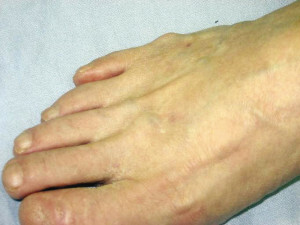 A verbal “yes “or no response when the monofilament is touched to the foot is the only acceptable response to the test. A “grunt” or “I reckon” are not acceptable responses. 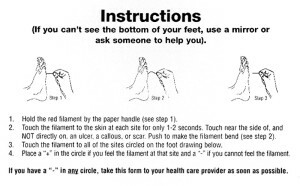 The second method is called the “Forced Choice Method.” In this variation, the patient is told that the examiner will say the words “one” and then “two.” The monofilament will be touched to the foot during either the “one” or “two” count. Patients are then asked to report if they felt the monofilament after the word “one” or the word “two”. The third method, which has been described to me by numerous practitioners dating back to 1978, is called the “Location Method.” The monofilament is touched to the foot and patients must report which foot and the specific location that was touched: under the big toe, under the ball of the foot or under the small toe area. It is never appropriate to ask patients, “Did you feel it?” when the monofilament is touched to the foot. This can cause them to believe that the foot is being touched and that they should say “yes,” even if they do not feel the monofilament touch the skin. The durability of the monofilament is another issue in performing a valid test. All monofilaments decrease in force after repetitive use. In a busy practice, if nine sites are tested per foot (hallux, each of five metatarsal heads, plantar base of the fifth metatarsal, plantar medial arch and heel) and the filament is used bi-laterally, there can be a total of 18 cycles per patient. If 10 diabetic patients are examined per day, three to five days per week, the filament could encounter 500 to 900 cycles weekly. In one study, the average decrease in deformation force due to the repetitive use of the filament was 1.2 g after 500 uses.42 Because a new 5.07 monofilament requires 10 g of force to deform it, this type of decrease in force could lead to false positives. It is therefore important to be aware of usage and discard the filament in a timely fashion. Figure 4. Hallux abducto valgus deformity. Foot deformities of the bones, soft tissues, or toenails are not more prevalent but are more problematic in the diabetic patient, as they interact with shoe gear or their environment. This can lead to abnormal forces or silent, painless trauma to the foot. Once the skin is injured, a wound can develop and become infected. The combination of neuropathy, vascular insufficiency and immunopathy can delay wound healing and lead to amputation. In the patient with diabetes, footwear is meant to cover, support, and protect the foot. It is critical to identify foot deformities so that patients can use appropriately sized footwear and accommodate the shape of their foot to protect it from a triggering event such as mechanical trauma. Bone deformities in the foot can be the result of faulty biomechanical function, diabetic motor neuropathy or a combination of both.43 In motor neuropathy, the nerves that innervate the 13 lumbricales and interossei muscles in the foot malfunction. The result is muscle atrophy, which can be measured by MRI and causes joint contractures in the toes that lead to bone and soft tissue deformities. Figure 5. Upper left: Corn on 2nd toe. Upper right: Callus below 4th metatarsal. Lower left: Pinpoint keratosis on 5th toe. Lower right: Soft corn between 4th and 5th toes. Soft tissue deformities, primarily keratoses, result from the body’s natural protective mechanism to shield the underlying bony structure from excessive pressure, caused by shoes or the environment. Due to sensory neuropathy and the loss of protective sensation, the patient with diabetes often cannot feel the pressure against the foot from the thickened skin lesions. The result can be the formation of an abscess under the keratosis. If not detected in a timely fashion, these abscesses can lead to infection, ulceration and osteomyelitis. Appropriate preventive care includes professional foot care for timely debridment of the keratosis, padding, accommodative insoles, or biomechanical orthotics with accommodations to offload the pressure sites. Shoe modifications, diabetic shoes or custom molded shoes may also be considered. Prophylactic surgical care to eliminate the bony pressure point is also an accepted method of care. and effective use of these medications. Confirmation of mycotic nail infection before prescribing medication is essential to minimize costs and potential drug-related complications. Testing for nail mold, yeast or fungal infections should be done before prescribing an oral antifungal medication. Foot care specialists should consider nail debridement and ongoing foot care to decrease the risk of a triggering event, such as a digital laceration during self nail care, that could lead to amputation. 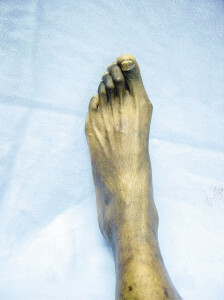 Performing a valid foot examination for amputation prevention involves the identification of pedal risk factors of the vascular and neurological systems and deformities of the bones, soft tissues and toenails. Identification of the patient’s pedal risk factors and establishing a preventive foot care plan to prevent ulcers, infections, and amputation in the patient with diabetes is critical to ulcer and amputation prevention, increasing the patient’s quality of life, and controlling health care costs. Mark Hinkes, DPM, is chief of podiatry and director of podiatry education at the Veterans Affairs Medical Center in Nashville and the VAMC in Murfeesboro, TN. He is also chairman of the VA’s PACT (Preservation-Amputation Care and Treatment) program. His book, Keep the Legs You Stand On, is available at www.amputationprevention.com. 2. Driver V. Limb salvage feelings lost and the diabetes scorecard. A feeling lost. Diabetes in Control 2004;(197). Available at: http://www.diabetesincontrol.com/index.php?option=com_content&view=article&id=29. Accessed August 4, 2009. 3. International Working Group on the Diabetic Foot website. Available at: http://www.iwgdf.org/”www.iwgdf.org. Accessed June 15, 2009. 4. Kung H-C, Hoyert DL, Xu J, Murphy SL. Deaths: Final data for 2005. Natl Vital Stat Rep 2008;56(10):1-120. 5. CDC. National diabetes fact sheet, 2007. Available at: http://www.cdc.gov/diabetes/pubs/pdf/ndfs_2007.pdf. Accessed August 4, 2009. 6. Lefebvre P. Amputations linked to diabetes. Hospital Management.net 2005. Available at: http://www.hospitalmanagement.net/features/feature627/. Accessed July 26, 2009. 7. U.S. Dept. of Health and Human Services, National Center for Health Statistics. National Hospital Discharge Survey, 1996. 8. Levin ME. Preventing amputation in the patient with diabetes. Diabetes Care 1995;18(10):1383-1394. 9. Apelqvist J, Ragnarson-Tennvall G, Larsson J, Persson U. Long-term costs for foot ulcers in diabetic patients in a multidisciplinary setting. Foot Ankle Int 1995; 16(7):388-394. 10. Singh N, Armstrong DG, Lipsky BA. Preventing foot ulcers in patients with diabetes. JAMA 2005;293(2):217-228. 11. Reiber GE. Epidemiology of foot ulcers and amputations in the diabetic foot. In: Bowker JH, Pfeifer MA eds. The Diabetic Foot. 6th ed. St. Louis: Mosby; 2001: 13-22. 12. Robbins JM, Strauss G, Aron D, et al. Mortality rates and diabetic foot ulcers: is it time to communicate mortality risk to patients with diabetic foot ulceration? JAMA 2008;98(6):489-493. 13. Bild DE, Selby JV, Sinnock P, et al. Lower-extremity amputation in people with diabetes: Epidemiology and prevention. Diabetes Care 1989;12(1):24-31. 14. Hinkes MP. Preservation Amputation Care and Treatment (PACT) Program Data 2003-2008; 2009 (unpublished). 15. Pendsey S, Abbas ZG. The step-by-step program for reducing diabetic foot problems: a model for the developing world. Curr Diab Rep 2007;7(6):425-428. 16. The International Working Group On the Diabetic Foot. Diabetic foot care education programme for the training of certified Diabetic Foot Care Assistants. Available at: http://www.iwgdf.org/index.php?option=com_content&task=view&id=88&Itemid=139. Accessed July 26, 2009. 17. Mousley M. Diabetic foot screening: why it is not assessment Diabetic Foot 2006;9(4):192-196. 18 Foster AVM. Podiatric assessment and management of the diabetic foot. London: Elsevier Health Sciences; 2006. 19. Bowker JH, Pfeifer MA eds. Levin and O’Neal’s the diabetic foot. 7th ed. Philadelphia: Mosby; 2008. 20. Nather A. Diabetic foot problems. Singapore: World Scientific; 2008. 21. Hinkes M. Keep the legs you stand on. Mequon, WI: Nightengale Press; 2009. 22. Boulton AJM, Connor H, Cavanagh PR, eds. The foot in diabetes. London: J. Wiley & Sons; 2000. 23. Tollafield DR, Merriman LM, eds. Clinical skills in treating the foot. 2nd ed. New York: Churchill Livingston; 2005. 24. Boulton AJ, Armstrong DG, Albert SF, et al. Comprehensive foot examination and risk assessment: a report of the task force of the foot care interest group of the american diabetes association, with endorsement by the American Association of Clinical Endocrinologists. Diabetes Care 2008;31(8):1679-1685. 25. Wrobel JS, Armstrong DG. Reliability and validity of current physical examination techniques of the foot and ankle. J Am Podiatr Med Assoc 2008;98(3):197-206. 26. Frykberg RG, Zgonis T, Armstrong DG, et al. Diabetic foot disorders. A clinical practice guideline (2006 revision). J Foot Ankle Surg 2006;45(5 Suppl): S1-66. 27. Santilli JD, Santilli SM. Chronic critical limb ischemia: diagnosis, treatment and prognosis. Am Fam Physician 1999;59(7):1899-1908. 28. Lazarides MK, Giannoukas AD. The role of hemodynamic measurements in the management of venous and ischemic ulcers. Int J Low Extrem Wounds 2007;6(4):254-261. 29. Wu SC, Driver VR, Wrobel JS, Armstrong DG. Foot ulcers in the diabetic patient, prevention and treatment. Vasc Health Risk Manag 2007;3(1):65-76. 30. Robertson GS, Ristic CD, Bullen BR. The incidence of congenitally absent foot pulses. Ann R Coll Surg Engl 1990;72(2):99-100. 31. Flanigan DP, Ballard JL, Robinson D, et al. Duplex ultrasound of the superficial femoral artery is a better screening tool than ankle-brachial index to identify at risk patients with lower extremity atherosclerosis. J Vasc Surg 2008;47(4):789-792. 32. MacDougall AM, Tandon V, Wilson MP, Wilson TW. Oscillometric measurement of ankle-brachial index. Can J Cardiol 2008;24(1):49-51. 33. Stein R, Hriljac I, Halperin JL, et al. Limitation of the resting ankle-brachial index in symptomatic patients with peripheral arterial disease. Vasc Med 2006;11(1):29-33. 34. Bruce SG, Young TK. Prevalence and risk factors for neuropathy in a Canadian First Nation community. Diabetes Care 2008;31(9):18371841. 35. Tantisiriwat N, Janchai S. Common foot problems in diabetic foot clinic. J Med Assoc Thai 2008;91(7):1097-1101. 36. Stacpoole-Shea S, Shea G, Lavery L. An examination of plantar pressure measurements to identify the location of diabetic forefoot ulceration. J Foot Ankle Surg 1999;38(2):109-115. 37. Olmos PR, Cataland S, O’Dorisio TM, et al. The Semmes-Weinstein monofilament as a potential predictor of foot ulceration in patients with noninsulin-dependent diabetes. Am J Med Sci 1995;309(2):76-82. 38. Pit’hová P, Pátková H, Galandáková I, et al. Differences in ulcer location in diabetic foot syndrome. Vnitr Lek 2007;53(12):1278-1285. 39. Birke JA, Franks BD, Foto JG. First ray joint limitation, pressure, and ulceration of the first metatarsal head in diabetes mellitus. Foot Ankle Int 1995;16(5):277-284. 40. Isakov E, Budoragin N, Shenhav S, et al. Anatomic sites of foot lesions resulting in amputation among diabetics and non-diabetics. Am J Phys Med Rehabil 1995;74(2):130-133. 41. U.S. Dept. of Health and Human Services, Health Resources and Services Administration. How to use the LEAP monofilament. Available at: http://www.hrsa.gov/leap/monofilament.htm. Accessed July 26, 2009. 42. Yong R, Karas TJ, Smith KD, Petrov O. The durability of the Semmes-Weinstein 5.07 monofilament. J Foot Ankle Surg 2000;39(1):34-38. 43. Vuorisalo S, Venermo M, Lepäntalo M. Treatment of diabetic foot ulcers. J Cardiovasc Surg (Torino). 2009;50(3):275-291. 44. Mayser P, Freund V, Budihardja D. Toenail onychomycosis in diabetic patients: issues and management. Am J Clin Dermatol 2009;10(4):211-220. An excellent article packed with credible references which dispels the myth stating the future is brighter than ever for the Prosthetic field. Amputations may not be totally prevented however there is clear evidence of decline in the non-traumatic amputation rate secondary to diabetes since 1996 (CDC statistics). The prosthetic clinician of the tomorrow, literally tomorrow, would be well advised to pay attention to these trends and make changes in their practice management methods and clinical protocols to reflect the decreasing patient loads and decreasing reimbursements in order to remain a viable health care provider for those who do unfortunately have an amputation. I would like to add Socks. this is onother important supply that is a must. It is amazing how many diabetics will not wear socks, apart from the added protection for the feet, it also keeps the shoes cleaner and obsorbs the perspiration. We routinely reccommended white non-binding socks. White helps patients identify any bleeding that might be occurring. 1) A sample of fluid from the wound has to be taken with care. 2) The bacteria has to be grown in a lab. Too often the results come back “no observable growth”, “could not identify the bacteria responsible”.There are reasons for this that are not fully understood, but let me just say that reputable labs fail to grow the bacteria while others are successful. There is a time consuming, more expensive, way to try to grow the bacteria, without using the standard procedure that every medical student is introduced to. Instead of trying to grow the bacteria by swiping a swab in media in a petri dish it is more reliable to try to grow it in a broth. Not as high throughput though, so good luck in finding anything but a research lab that is willing to do that. But knowing the species is very important, months can be lost with ineffective antibiotic treatments otherwise. 4) The solution is a test that is approved in Canada, and available on a research basis in the US, that goes beyond the standard MIC test and tests antibiotics and combinations of antibiotics against the biofilm state of the guilty bacteria. 5) I have a heavy financial interest in the success of this test, so you need to do your own investigation of the validity of what I have said above. Check out the website http://www.chronicinfectionproblem.com and if you are a patient contact your doctors, especially if they have had difficulty in identifying the bug or if they have you on an antibiotic therapy that is not working, that is, if you are running out of options.